Drivers could be given extra incentives to switch to for ultra-low emission vehicles, including being allowed to use bus lanes and given priority at traffic lights under a consultation on Clean Air Zones. 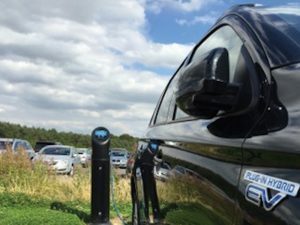 The Defra consultation on the introduction of Clean Air Zones in five UK cities – Nottingham, Derby, Southampton, Leeds and Birmingham – has said that councils should provide benefits to drivers using ULEVs, including allowing access to bus lanes, exemptions from other restrictions such as one-way systems, and priority at traffic lights for ULEVs. It also suggests providing preferential parking bays or access for ULEVs and lower parking fees. The consultation also calls on local authorities to rethink their fleet strategies to ensure vehicles that they operate meet the standards for the zone while also looking at car clubs and car sharing schemes, cycling incentives and facilities, or flexible working practices. And the consultation also reiterates the intention to restrict access for older vehicles in the zones. Nottingham, Derby and Southampton would have restrictions on HGVs, buses, and taxis, Leeds and Birmingham would see restrictions on those vehicles plus vans. Private car owners would not be affected. However, the RAC said that introducing separate rules for ULEV drivers could cause confusion. Roads policy spokesman Nick Lyes commented: “There may be some merits in allowing ultra-low emission vehicles to use bus lanes where appropriate, but some other aspects could be a recipe for road safety chaos and confusion, in particular exempting ultra-low emission vehicles from one-way streets.